With the People’s Majlis, or Parliament, commencing its delayed inaugural session for the current year with the customary address by President Mohammed Waheed Hassan, even if in the midst of disturbances caused by the majority Maldivian Democratic Party (MDP), the stage may have been set now for political reconciliation in Maldives. If nothing else, neither can the MDP be seen as continuing to stall parliamentary proceedings without increasing international opprobrium nor can the Government parties argue that in the absence of peace in Parliament, they could not be expected to discuss and vote on advancing presidential polls, as promised. Addressing Parliament, President Waheed declared his intention to facilitate early elections, as promised to India and the rest of the international community after MDP predecessor Mohammed Nasheedpost facto claimed that a ‘mutiny’ by a section of the armed forces and police was the chief cause for his widely-telecast resignation on February 7. On another note of concern to the MDP, both while in office and otherwise, he spoke about plans to “empower” the independence of institutions like the Majlis and the country’s judiciary by not “interfering” with their work. In his days in office and outside, President Nasheed and his MDP colleagues had often talked about ‘reforming’ the judiciary and other independent institutions, translating in effect into what the Opposition called ‘interference’. “This is the time for all of us to work together in one spirit, the time to bring political differences to the discussion table in order to formulate solutions. According to the Constitution, the earliest date for a presidential election is July 2013. If a presidential election is required at an earlier date, changes need to be made to the Constitution. I will do everything in my power to bring together all the political leaders, to hold discussions on the matter,” President Waheed said in his inaugural address, when Parliament reconvened on Monday, March 19, after MDP members inside the Chamber and street-protesters had stalled the originally scheduled sitting on March 1 in an unprecedented manner. Independent of the street-protests that have continued until after the security forces had swung into action a day after the presidential address and removed an ‘MDP camp’, in what is argued to be the land allotted to the Maldivian National Defence Force (MNDF), in turn leading to a court case, there now seems to be some scope for reconciliation in regard to the continuing political deadlock. While arguing the MDP’s case on substantive issues, a Commonwealth ministerial team, on its second visit to the country since Nasheed quit office, did not take kindly to his party members disrupting parliamentary proceedings. Then as now, the International Parliamentary Union (IPU) too has decried the MDP behaviour inside Parliament, both on March 1 and 19. From within the MDP, there have been increasing voices against street-violence by party cadres, and also on the need for the party to return to the negotiations table for taking its agenda forward. Party president and former president Ibrahim Didi was among the first to criticise cadre-violence, targeting public and private property. Included in the list in recent days was the building housing the media establishment of former opposition Jumhooree Party founder and one-time Finance Minister Gasim Ibrahim, who in turn is among the richest in the country. Sooner than later, the MDP will be called upon to test President Waheed’s constantly-reiterated commitment to early polls, by participating in the all-party talks, initiated at the latter’s instance weeks ago. Two other political parties, namely the DRP and the PPM, both founded by Nasheed’s predecessor Maumoon Gayoom, with he himself now being associated only with the latter, had decided to stay away from the talks after the MDP did so in the past. They too have now to be talked into returning to the negotiations table, if the reconciliation process has to go anywhere. They may want guarantees that the MDP would stick to the negotiations table until a clear picture emerged on the future course. DRP leader Thasmeen Ali however has since reiterated his party’s original commitment to facilitate early presidential polls, pointing out however that the MDP would have to let Parliament function for that to happen. From within the MDP, too, a few voices are being heard about the need for the party’s participation in the all-party talks, if only for it to take the logical next step to early polls, and also let Parliament function normally — again, with the same end in mind. It is a chicken-and-egg question when it comes to finalising the date for the presidential polls. The MDP wants the Government to announce the poll-date first whereas the Government parties want the procedural issues in this regard addressed before they could take the logical next step. Or, that is the argument. The MDP is also unclear if they want a tentative date and a commitment to the effect from the Government — or, would want a formal notification before they could re-join the reconciliation process. The latter could prove problematic as the Election Commission — and by reverse extension, the Government — is not authorised to do so in the absence of a constitutional amendment. Under the Third Republican Constitution of 2008, once-in-five-year presidential polls, now due in November 2013, could be conducted within three months of the due date. Any advancement, by implication, has to be facilitated by a constitutional amendment carrying two-thirds majority in the Majlis — and may require judicial concurrence, if contested. Though being the majority party in Parliament, the MDP too falls woefully short of the magic number. While the party was able to push its position from being the second largest group in the House after the parliamentary polls in 2009 to the top slot, the post-resignation period has not provided any comfort in pushing the numbers further up. The MDP distanced itself from the negotiations process when the all-party meeting was scheduled to discuss the prioritisation of items in the outline agenda that had been mutually agreed upon. Apart from setting the priority list for the talks from the draft agenda, the all-party meeting will have to go into substantive issues falling under each of the subject-heads. The MDP wants the entire process fast-tracked so as to decide on the poll date first. The Government parties are keen also to discuss institutional reforms, as some of them are concerned about the existing estrangement between the security forces and sections of the national polity, which could spell doom, before, during and after the polls, if a meaningful reconciliation effort is not put in place and executed with elan. Time is the essence for all concerned. Given their internal contradictions, the Government parties are sure to find mutual accommodation among themselves a tougher proposition than they may have bargained for. The younger elements in many of these parties may not have the same regard from Gayoom as the earlier generation, with the result, they may contest whatever compromise that might be arrived at on specific issues where his counsel could otherwise prevail. In its turn, the MDP faces the danger of the focus of its current protests and political position slipping away, with extraneous factors coming to dominate the inner-party discourse. The Nasheed leadership has been able to streamline stray yet powerful voices within the party that has talked freely against street-violence and for the MDP to re-join the political process. Senior party leaders who have spoken on such issues have since been quick to point out that it was only a part of the internal mechanisms, and on all issues, including the continuance of street-protests without violence, they were with the leadership. As the MDP leadership may have seen for itself already, the continuing non-cooperation with the Government on the commitments that the latter has made in relation to restoration of normalcy, and more importantly, early presidential polls, has not gone down well with friends of the party elsewhere and non-cadre sympathisers nearer home. The latter in particular are already feeling the pinch of street-protests interfering with the peaceful daily life that they had been used to — with financial consequences to individuals, too. However, President Waheed followed this up with a more direct reference to nationalism, per se. 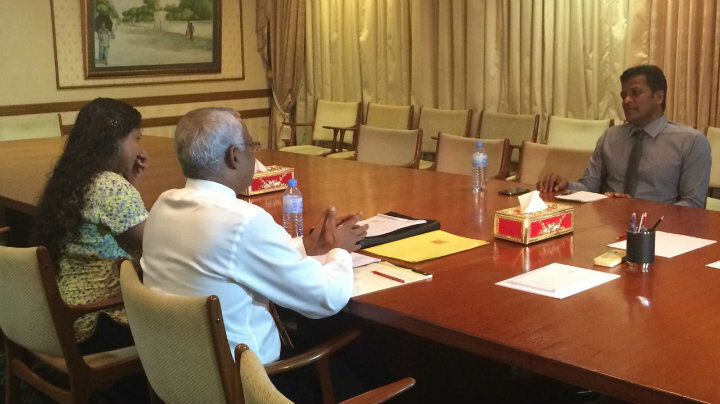 Said he in this regard: “Special efforts will be made to strengthen national spirit and togetherness of Maldivians. Activities to understand our history, culture and nationality will be conducted.” This reference is less perfunctory than it may sound, though the more direct mention of Islam may or may not be as purposeful as it too may read. As may be recalled, throughout the campaign for the introduction of multi-party democracy in Maldives, the MDP in the years before 2008 had constantly referred to what it propagated as President Gayoom’s efforts at Islamisation of Maldives – an idea that caught the imagination of the pro-Nasheed West in the post-9/11 era in particular. All efforts at removing President Nasheed throughout last year without the required two-thirds majority in the Majlis for his possible impeachment culminated not in any political protest but in the formation of a ‘December 23 Coalition’ by religious NGOs, to protect Islam in Nasheed’s Maldives, with the political opposition seeing in it a chance to evolve a national movement of sorts. In the days and weeks after President Nasheed’s exit, President Waheed has been constantly and continuously referring to Islam in all his public appearances. While it makes sense in the larger context, his allies in Government have been careful not to make such references and thus possibly provide political space for religious groups outside the existing electoral spectrum. If it signals a fracture in electoral thinking between President Waheed and his political allies remains to be seen. Yet, in the context of the party’s calls for early polls, the MDP too has been silent on this score, after having chided and criticised the rest on what it called ‘fundamentalist religious’ counts during the run-up to the December 23 protest and before – but not afterward. The writer is a Senior Fellow at Observer Research Foundation. Visiting President of Timor-Leste (East Timor) Dr José Ramos-Horta was met with a seven-gun salute this morning at the president’s jetty, the first day of his state visit to the Maldives. The two countries signed an agreement to promote cultural exchange and encourage travel through a visa agreement. Introducing the Nobel Peace prize-winning head of state, Maldives President Mohamed Nasheed said Timor’s experience with transitional justice following its independence provided valuable insight for the Maldives’ own process of national reconciliation. “His excellency [Ramos-Horta] is no ordinary head of state – he is a renowned, fearless and uncompromising champion of human rights,” Nasheed said. “We can learn from their experiences building democracy and of transitional justice. He pledged Timor’s support for the Maldives’ bid to join the UN Council of Human Rights, praising Nasheed’s “creativity, commitment, and conciliatory and compassionate approach to past political opponents”. Timor Leste, like the Maldives, was one of the few countries “to have ratified ever human rights instrument, on day one our our succession to independence,” Ramos-Horta said. “It took 24 years of occupation [by Indonesia] before we freed ourselves, and tens of thousands of people died. And yet there is no anger or resentment between us and former occupiers – we have the best possible relationship, and thousands of Indonesians are still living in Timor without abuse or discrimination. Ramos-Horta said a conciliatory approach following Timor’s independence had led to heavy criticism from “heroic bureaucrats” in the United Nations and Brussels, who favoured an “international tribunal to try everyone in Indonesia who was involved in the crimes of the past.